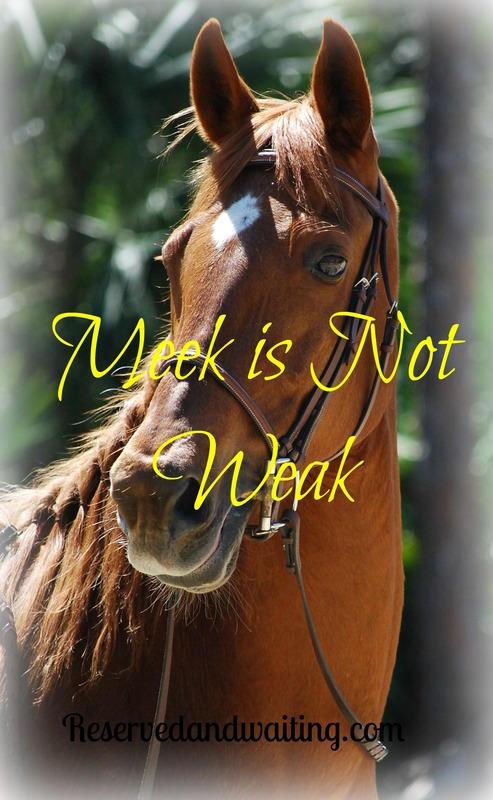 Meek Is Not weak, on the contrary. Meek Is very strong! It takes a strong and courageous person to develop the characteristic of being meek. One cannot develop this characteristic on their own. It can only be achieved through Christ alone. Blissfully she went about her day; caring over her child and tending to the daily chores. Her world came to a sudden crushing blow when he walked through the door. He started in on her, throwing insult after insult at her; leaving her standing there raw with the pain. The choice was hers to make. How will you respond was the whisper in her ear. The next day with as much courage as she could muster up, she recruited some help to reach some of his demands. Not because he demanded them or even because he threatened her with consequences if things did not change. It was because she wanted to display God’s love to his life by allowing the fruits of the Spirit to be revealed through her life. Through he actions. Is this someone you would call weak? No, she is meek. For meek is not weak in the eyes of God, when we interact with those around us in a way that brings glory and honor to Him. It was a grace that she can give, to one who was undeserving. Just as we are undeserving of God’s graces and mercies. When we strive to display the fruits of the Spirit in our live with grace and humility. The Lord will be our strength and through Him alone we can be meek. All the struggles we go through. We have a choice on how we are going to respond. Will you chose to show grace with humility and bring glory and honor to God? “They will inherit the earth”. In Revelations 21:1-5, it tells us that John saw a new heaven and a new earth. This is the earth the meek shall inherit. The reason I believe this is because when you go down to verse 7 of this same chapter, we read. “Those who are victorious will inherit all this”. In order to be victorious, we need to be growing in our relationship with God. As we are growing, we will be able to reflect God more and more because we are opening our heart, mind and soul to His will and His ways. Check back on Wednesday, when we study through Matthew 5:6. These two post will be linked together to share on GROW in His Word Fall Session 2014. Until then may God richly bless your walk in Him. Loved reading your reflections here, Crisi! “Meek is not Weak” also stood out to me through these verses. 🙂 Thank you for sharing this!